Initially Nike came to us to design a product catalog to debut their new cycling gear. 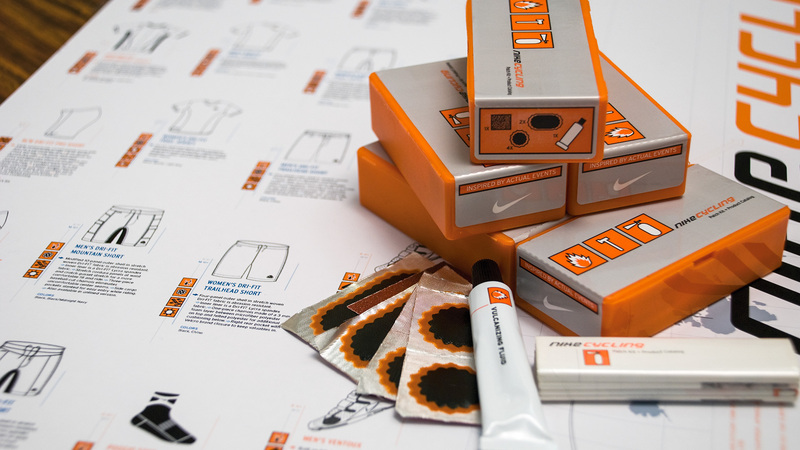 Never satisfied with the status quo, we rethought the traditional brochure and presented Nike with the idea of creating a catalog within a patch kit, with hopes that it would get thrown in the bike bag, not the garbage bag. The patch kit contained everything needed to repair that pesky flat and find good-looking product to do it in. These kits were handed out at cycling events and poly-bagged with a number of cycling magazines across the US. With the success of the patch kit, we were asked to continue the look and feel of the patch kit into a redesigned website, a series of print ads, and 5 TV spots that aired during the Tour de France to round out the campaign. This campaign was produced and managed for 3 years as joint effort between Incubate and Weights&Pulleys.